As a backdrop, when we think about the precious metals investment spectrum as a whole, we often think about the relative merits of gold versus silver, or physical metals versus mining equities. And of course, each component of the precious metals world has a different risk and reward profile. For example, physical gold is usually known to be the “safest” asset within the metals spectrum, whereas silver is generally known to be more volatile – moving higher on a percentage basis when the metals move up, but also falling further when the metals move lower. The mining equities are likewise known to be more volatile than the metals themselves, as the miners’ profits are leveraged to the prices of bullion. Finally, smaller mining operations are inherently more risky and potentially rewarding than larger companies, as a small discovery can have a tremendous impact on a junior company’s bottom line, whereas it takes a much greater fundamental development to impact a larger company in the same way. What we see above is that over the last six weeks, as the prices of both gold and silver have remained mostly even, the stock prices of junior silver miners have collapsed by over 15%. What is happening to cause the valuations of companies that derive their profits from silver to fall so dramatically while the prices of the underlying metals have not changed? Recall again from the risk / reward spectrum above that the junior silver miners are the most risky and potentially most rewarding slice of the precious metals arena, whereas the physical metals are generally the safest. Investors understand these properties of these markets – and they choose to invest according to their own risk tolerances. Consider this: who chooses to invest in junior silver miners -- those who are seeking to preserve wealth for future generations? No, such investors turn to physical gold, which has stood the test of time back through the dawn of recorded civilization. Of course, this leverage can also work on the downside, so investors must be careful. The point is: junior silver investors tend to be the most speculative segment of the precious metals community, whereas physical gold investors tend to be the least speculative. This is not a judgement statement on either group – there is room for all, and speculation is an important part of a healthy market – but still it is important to understand the spectrum of investors who participate. Why Are Junior Miners Underperforming? Do we see other examples from history in which the junior silver miners – the most speculative part of the sector – so vastly underperformed the price of gold? Indeed we do, and the most important example occurred exactly at the January 2016 bottom in the gold and silver miners, which preceded the incredible rally of 2016. 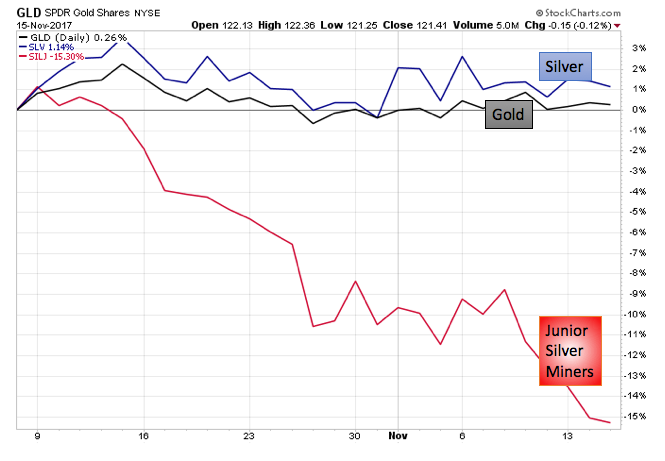 The junior silver miners / gold ratio – a comparison of the relative strength between the most speculative and the least speculative parts of the sector. The junior silver miners fund (SILJ). The price of gold itself (GLD). Note how in Part I, the junior silver miners / gold ratio has just made a new low for 2017. This new low in the ratio is another way of expressing the 15% loss in the silver miners amongst flat gold and silver prices, shown at the top of the article. Immediately above Part I, we show the RSI momentum indicator for the ratio. Note how this indicator made a low below 30 on the index in January 2016, as the junior silver miners succumbed to selling pressure even as the price of gold was putting in its most important low of the past five years at $1,045 per ounce. In other words, the most speculative part of the industry “got it wrong” at the worst possible moment, thinking gold and silver prices would continue to fall, when in fact prices were ready to surge in the best first-half performance in 30 years. This same signal has just registered again. This is the only other signal that has appeared since the absolute bottom for the metals complex in January 2016. This suggests that the entire precious metals sector is currently forming a low of similar importance as the early 2016 low. In general, the most speculative portion of the industry attracts those investors who are looking for huge gains in a relatively short amount of time. Due to this nature, these investors are prone to extreme swings in sentiment, much more so that long-term gold bullion holders. 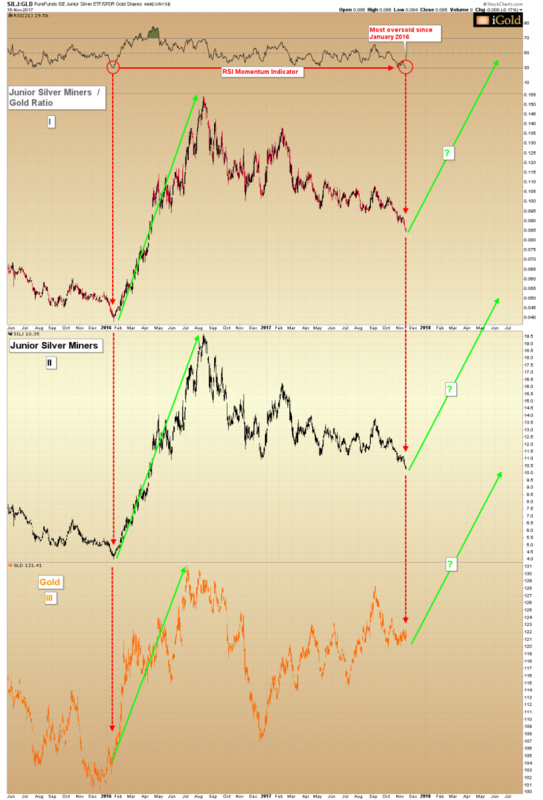 What our research shows is that when the most speculative side of the industry “gives up” on the hope for a large gain, even when the prices of the metals are consolidating, such causes the extreme divergence we see on only two occasions in junior silver miners / gold ratio. And when this divergence registers with an extreme oversold momentum reading (top of chart), it signifies a capitulation amongst the speculative side of the industry. This extreme sentiment divergence from the most speculative side of the sector occurs only at important turning points in the market. 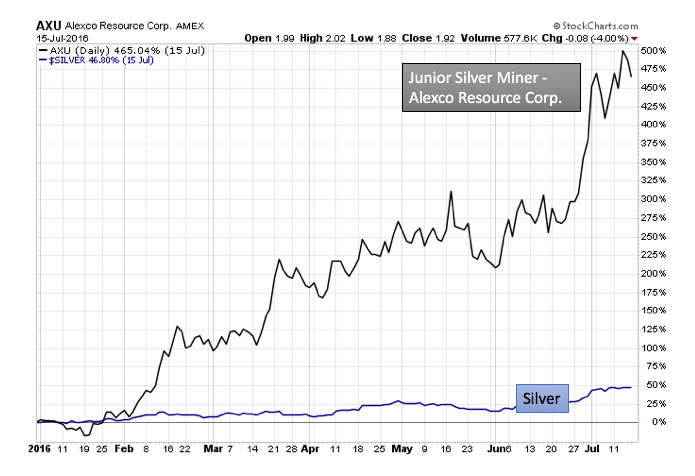 Junior silver miners are the most leveraged and risky side of the precious metals spectrum. Investors in this sector desire oversized rewards in a short amount of time. When the precious metals do not rise as quickly as they would hope, they tend to give up and sell, even if the metals themselves are not falling. This accounts for the extremes we see in the ratio at key turning points. The junior silver miners / gold ratio has just formed its lowest oversold reading since the January 2016 bottom. Our analysis in other articles suggests that an important low is presently forming in the gold price, yet junior mining investors are once again giving up. Precious metals investors should consider these contrary sentiment indicators in preparing for what could be an exciting 2018.